4.1 out of 5 based on 12 bloggers and 2 commenters. BlogPress Responsive is a free premium blogger template with 2 columns, responsive design, magazine-styled, right sidebar, gallery-styled, minimalist, an exclusive design for Blogger, ads ready, slider, social bookmarking icons, posts thumbnails, breadcrumbs, pagination, a background pattern, related posts support and well designed threaded comments. 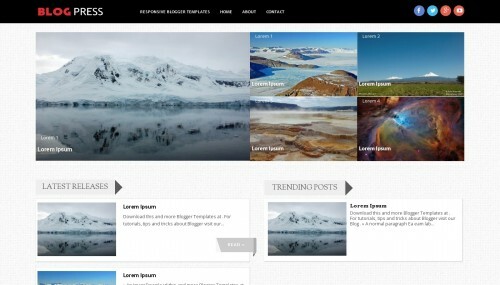 Excellent template for blogs about any general topic, news, photography or a personal portfolio site. Como faço para alterar o rodapé das postagens com minhas informações? Pois ja vem uma foto e informações determinadas, gostaria de mudar.